Tentative clam has been reigning over the besieged Gaza Strip after the Israeli occupation army continued to attack Gaza last night and at dawn Tuesday despite the ceasefire that was announced by Egypt and UN. 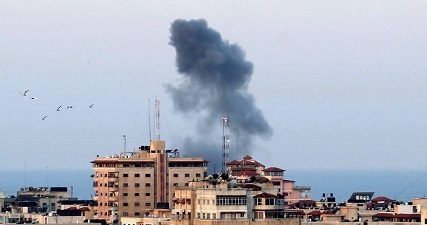 According to the government media center in Gaza, 50 airstrikes in total were waged on Monday and Tuesday by Israeli warplanes on apartment buildings, civilian facilities, agricultural plots of land and resistance sites. At least 10 citizens suffered injuries during those aerial attacks, which also caused considerable destruction to civilian property.